There are some conversations I wish we didn't need to have, some questions I feel are too absurd for answers, some controversies I wish I didn't even have to acknowledge as controversies... One of those conversations/questions/controversies is that of "women in ministry." "Do you believe in women in ministry? ", some will ask. And I lament the fact that, in this day and age, such a question can even be relevantly conceived. With all the richness of the feminist critique, with all our resources in biblical interpretation, and with what I wish could pass as common sense, I have trouble with the fact that some people (including some women! ), very respectable and intelligent ones at that, still would deny the call of God on the lives of women to ordained pastoral ministry (or any other office of ecclesial leadership, for that matter) simply by virtue of their being women. It's just chauvinism! It comes from a manufactured discomfort with female leadership produced by decades and centuries of male-superiority-delusions and lies. It is the product of conscious and subconscious oppression and repression. However, I must name and confess my own arrogance here. I forget that it took me a long time to get to this point and to develop such a strong opinion on this front. To reduce the arguments of those who would keep women out of the pulpit to mere chauvinism is not totally fair. It comes as much from a sincere reverence for scripture as it does from simple subjective discomfort. The Bible is too complex for me to act like I've got it figured out and they're just too dumb to see it my way. So you can chalk up my candor in the previous paragraph (and perhaps all the others) as a vent of frustration. Many of my good friends have at least a healthy level of personal caution when it comes to male and female roles in the church, and many of these good friends have read and seen the same material I have regarding theological and biblical perspectives and they still hold reservations which I do not. These are intelligent people that the feminist critique can sometimes forget or marginalize. 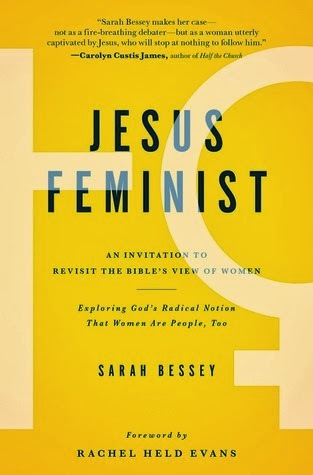 A couple of weeks ago, I read Jesus Feminist by Sarah Bessey. Sarah describes herself as a Jesus Feminist (shouldn't there be a hyphen in there, Sarah?) and she does not forget or marginalize the voices of her opposition the way I sometimes do. She does not forget her journey the way I sometimes do. Her book offers something of a feminist critique that will still be intelligible for Evangelical Christians who aren't necessarily ready for the likes of Rosemary Radford Ruether (who I really appreciate, by the way). While, perhaps by virtue of my own arrogance, I may always find it absurd that we should have to argue for women's place in the leadership of the church, I am glad that there are people like Sarah Bessey who can give credibility to the conversation without my degree of cynicism. Sarah is a wordsmith, to say the least. She's refreshingly hopeful. By that I mean she's had an experience that could make anyone cynical, but she's decided not to be. She refuses to give up on Evangelicalism and she makes a call to the church, a call of which we should lament the necessity, to affirm God's invitation to women to fully enter the church's life. In reading this book I often found myself forgetting my own history with the church, perplexed that there should be any reason for her to have to say some of the things she was saying. After all, who would deny God's call on the lives of women merely by virtue of their being women?! I might want to forget and ignore those voices even though mine used to be one of them, but Sarah doesn't ignore those voices. She graciously and in Evangelical vernacular, shares her perspective as a woman on the Bible, Jesus Christ, and the Kingdom of God. Her perspective is fresh and inspiring and offers renewed hope in God's future for the church and for women in the church. She's solidly Evangelical and won't be interpreted as a feminist by most feminists. But I'm glad she embraces the term and opens it up for many others to embrace it as well. This book is not as controversial as it's title might suggest. She's not even very explicit in calling the church to affirm the ordination of women. She simply invites the reader to see the dignity of women and to, as she asserts on the cover, "[explore] God's radical notion that women are people, too." People need to read this book. If you still have your reservations about women in ministry (and you tolerated my pretentiousness this far... sorry 'bout that, by the way), you'll be challenged but not offended by this book. If you're suspicious that women should probably have just as much say in the church as men, but you're not sure how to confirm your suspicion, this book is for you. And if you're a woman in the church, feeling like your place there is being compromised just because you're a woman, this book might even be liberating.